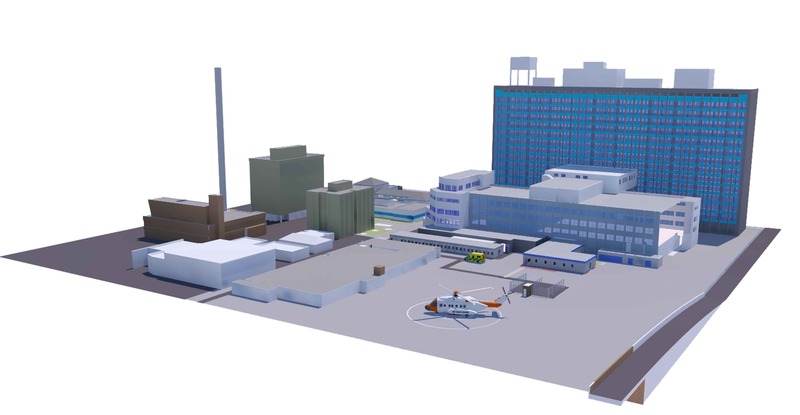 Hull University Teaching Hospitals NHS Trust has submitted proposals to Hull City Council’s Planning Committee to create a new helipad at the back of Hull Royal Infirmary. The hospital serves the region as a Major Trauma Centre, regularly receiving emergency patients via helicopter and organising patient transfers via air ambulance. A number of providers currently fly in to Hull Royal Infirmary, including Yorkshire Air Ambulance and Embrace, the children’s air ambulance based in Barnsley, South Yorkshire. “Hull Royal Infirmary (HRI) is a major trauma centre for the region, so it’s important that we have the estate and the infrastructure to support this role. The recent, multi-million pound redevelopment of the Emergency Department has given us the most up-to-date medical facilities in which to treat patients, so the development of an on-site helipad is the next piece of the jigsaw. “Helicopters bring patients to the hospital on an almost daily basis now, but currently land on a helipad situated in a field just over the road from the hospital. An ambulance is then required to transfer each patient from the helicopter, negotiate the busy junction onto Anlaby Road, and then transport the patient to the Emergency Department. All of this takes time, and in emergency situations, every second counts. The Trust has consulted with all air ambulance providers currently transporting patients to HRI prior to submitting its planning application. Alternative accommodation for staff currently housed in the outgoing buildings has been identified at both Castle Hill Hospital and elsewhere on the HRI site. Subject to the necessary planning approvals, demolition would begin in early 2017 and the helipad would be expected to be ready and operational by the Spring.